A Tale of Earthly Kings. The people realized that God was at work among them in what Jesus had just done. They said, “This is the Prophet for sure, God’s Prophet right here in Galilee!” Jesus saw that in their enthusiasm, they were about to grab Him and make Him king, so He slipped off and went back up the mountain to be by Himself. History shows us that while the best kings have been those picked by the people, the very worst kings have been chosen by the people as well! In other words, being picked as king just because the people choose it, does not necessarily mean it will be a good thing! So it is with Jesus here in today’s passage from John’s Gospel. Back in the days of Samuel, the Old Testament seer-sage, God’s people clamored for a king so that Israel could be just like the other nations surrounding them. If you remember that story, this decision of the people, by the people, and for the people didn’t produce the good fruit those same people had hoped it would. While Saul did prove to be the conquering hero Israel was looking for, ultimately this same man didn’t have the inward fortitude to keep his place of prominence in check with his heart. Eventually, the truth came out, and Saul, the great leader of Israel, failed in his assignment, leaving the people scattered and worse off than they were before the whole thing happened. 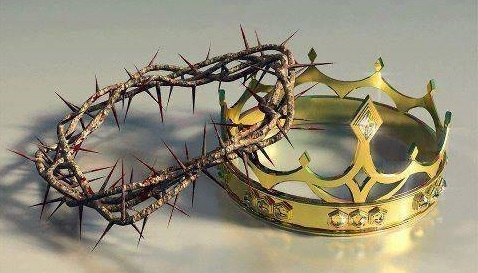 And when it comes to the people picking their king, Jesus knew full well that He wanted no part of any political posturing based on His growing popularity. In truth, popularity amongst the people might just be one of the most intoxicating poisons known to man. As one author states, popularity can poison the brain, making one believe things about one’s self that just aren’t true. History is full of stories where kings and czars and presidents have allowed their high position to go to their heads, pushing them to do and say things that were miles from the realities around them. So it is with so many in ‘kingly’ roles in the church today. Sadly, the intoxicating aroma of the 3-B’s woos men and women to follow this ugly trail so many have wandered down before. The three scents of bigger Buildings, additional Bucks, and increased numbers of Butts in the seats become the ultimate motivators for those who hunger for success in ministry. As I see it, it would do us well, in the Americanized church, to revisit the ancient story of King Saul, reviewing this good tale of a good man who got voted into power by the good people of God. I’m sure Jesus had studied these revealing texts in the Scriptures many times during His thirty-something years of preparing Himself for public ministry. He knew with certainty that popularity amongst the people, which can lead to kingship, is an instant formula for failure for those called to serve God’s people. Thus, we see Jesus modeling for us today, the way a godly person needs to respond to such pressures. Jesus runs for the hills, removing Himself from this temptation as quickly as He can. Good move, Jesus. Very good move, indeed. My prayer: Thank You, Jesus, for this graphic reminder of how you want me to respond to the power of popularity. Since most everything in America has become a popularity contest, empower me to be more like You, running as fast as I can from the people who are crying out to make me king. You, alone, are our King, and since that office is filled, allow me to be content, like Saul’s successor, David of old, who positioned himself firmly into Your hands, allowing You to open and close doors of influence. For Your name’s sake. Amen. My questions to ponder: My suggestion today is to immediately pick up a few copies of the Gene Edwards classic, A Tale of Three Kings: A Study in Brokenness. Read it and give a few away to some fellow church leaders. Here in poetic fashion, Edwards offers us more hard questions to ponder about issues of leadership than can be answered in a lifetime. This one book has literally saved my life over the years as I have been faced with similar issues Jesus was tempted with: the power of persuasive people trying to pressure you into things God wants you to run from. A must read for anyone in any leadership capacity in any church!